“To them God chose to make known how great among the Gentiles are the riches of the glory of this mystery, which is Christ in you, the hope of glory” (Col. 1:27). As noted yesterday, Paul uses the term mystery to refer to a truth that was partially and dimly revealed under the old covenant but is now displayed in all its fullness to the new covenant people of God. 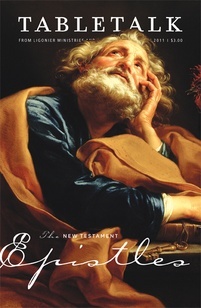 The apostle speaks of mysteries in several places in his epistles, including Colossians 1:25–27, and having spoken of his call to make clear “the mystery hidden for ages and generations but now revealed to his saints” (v. 26), Paul now identifies the mystery of which he is speaking. This mystery, made known among the Gentiles, is “Christ in you, the hope of glory” (v. 27). We take it largely for granted today that the gospel is for all people and that those who believe it become full citizens of the kingdom of God, heirs of all the promises that the Lord has made to His people throughout history. In the first century, however, this was a radical idea. Strict interpretations of the purity laws in the Torah — Genesis through Deuteronomy — made it difficult indeed for the earliest Jewish Christians to believe Gentiles could remain Gentiles and become faithful servants of Yahweh, the covenant Lord of Israel. It took both the intervention of God Himself and constant admonition from the apostles to convince the earliest Jewish believers that Jews and Gentiles could be full members of the same Abrahamic family in Christ (Acts 10; Gal. 2:11–14). To be fair to the ancient Jewish Christians, it is hard to find this idea of full citizenship for the Gentiles revealed in the old covenant. It is not entirely absent, as seen in the story of the Gentile woman Ruth, who became the great-grandmother of David, the greatest king of the old covenant (Ruth 4:13–22). Still, Ruth was the exception rather than the rule, so it is not surprising that the Jewish Christians had trouble accepting Gentile believers as full-fledged brothers and sisters at first. Jesus, by His Spirit, dwelling in all believers, no matter their background, makes Jews and Gentiles full citizens in the kingdom of God (Col. 1:27). We are all so identified with Christ that it is impossible for any Christian to be a second-class citizen. And we can add to this grace the fact that our hope of glory in Jesus has present and future aspects. In the present, we are assured that we belong to Him and will persevere so that in the future we will enjoy the full benefits of redemption — life in a resurrected body before the presence of God in the new heaven and earth (Rev. 21). It is all too easy for us to think of other people as lesser Christians than we are because of the way they dress, what they eat and drink, how knowledgeable they are about the finer points of theological arguments, and a host of other factors. We should always strive against this temptation to look down upon others, for Christ dwells in all who truly love Him, and He has given us all the same rights in His kingdom.